How do male crickets make their noise? Do they sing different songs? The sounds of crickets chirping as you lie in a tent camping is soothing and restful, a genuine outdoor sound. But when the sound is in the house, that’s a different story! Their persistent chirping is only interrupted by the presence of danger like you holding a fly-swatter trying to figure out where the sound is coming from. Once the danger is past, however, they get back to business. There are about 900 species of crickets. 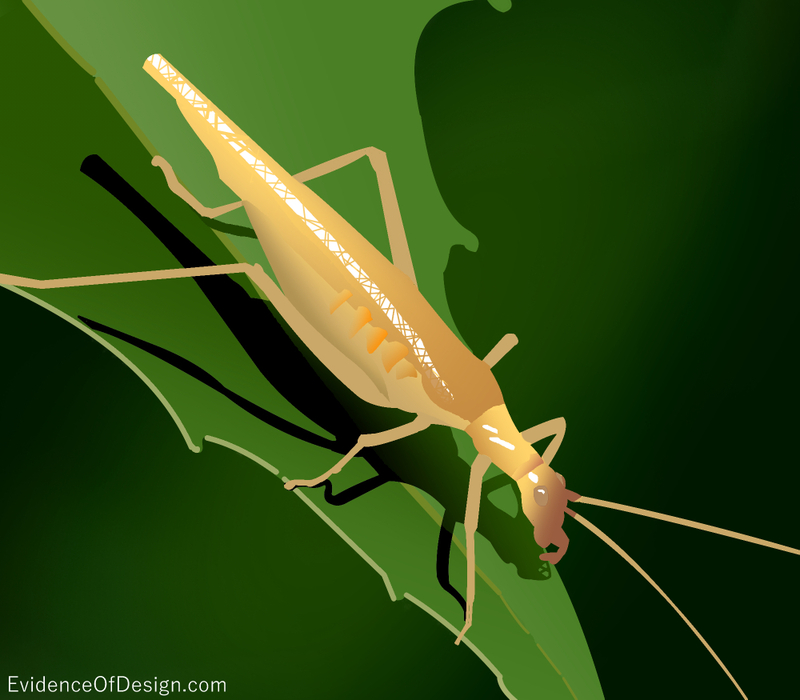 Tree crickets have somewhat flattened bodies and long antennae. They look a lot like grasshoppers in body structure and jumping hind legs. It is not by rubbing their hind legs together as some believe. It is more like rubbing your finger across a comb, only they use their wings. Each wing has a row of teeth on the underside at the front. The top of the wing is used as the scraper. It contains 50 to 300 ridges. The sound is made by raising both wings to a 45 degree angle and rubbing the top of one against the bottom of the other. The raised wings act like sounding boards. It sounds like this. The chirping sound is slightly higher than the highest octave on a piano. The tree cricket has four different songs but the main purpose of the chirps is to attract a mate and to announce to other males that they are in invading another cricket’s territory. The female picks up the sounds through her ‘ears’ located at her knees in her two front legs. One wonders how natural selection can account for both the scraper and the vein evolving to make this sound. If either of these was missing, no sound would be made, no female would be attracted, and no reproduction would take place. But the marvel of the cricket does not end here. Actually, the snowy tree cricket is sometimes called the “thermometer cricket” because it is easy to count the chirps and to see how well they correlate with the air temperature where the cricket is located. One formula for calculating the temperature is to count the chirps in 13 sec. and add 40. So a cricket chirping 20 times in 13 seconds would indicate the air temperature is 60º F. Interestingly, west of the Great Plains, the snowy tree cricket chirps a bit faster (at a given temperature) and the recipe changes—e.g., count the chirps in 12.5 sec and add 38. Several suggestions are given for why location affects their chirping rate.